NYC, 04/17/2019, 12:00PM. Beethoven's Piano Sonatas. 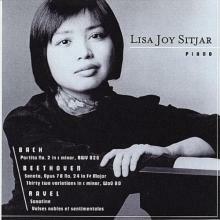 Lisa Joy Sitjar performs Beethoven's Piano Sonatas, Op. 27, Nos. 1 and 2. Lisa Joy Sitjar has performed extensively in New York City, with recitals at Merkin Concert Hall, Lincoln Center, the United Nations, the Museum of the City of New York, Trinity Church, among others. She has also performed at the Palais d’Athenée in Geneva, Switzerland.